Happier Than A Pig In Mud: In A Pickle Over Super Bowl Snacks? In A Pickle Over Super Bowl Snacks? Of course you do have to love dill pickles and this time I'm not even going to suggest veggies! -Mix all and serve at room temperature with chips. I found these beauties while perusing the pickle isle at Walmart, $1.62 of happiness! If you love pickles and like a little heat these peppers are great! I'd describe them as hot banana peppers in a bread and butter pickle brine. I've been eating them like M&M's! We like Lay's Dill Pickle Flavored Chips so this is has got to be good! Oh goodness gracious yum... I have a daughter who would adore this. She doesn't give a hoot about the Superbowl, but she would even watch football for pickle dip. Oh, the dip and the salad peppers would make the folks at my home happy! Need to get a jar of those. I shall have to try the dip too. I love Super Sunday food! Pickle dip... you sound amazing. Have you ever made olive dip, that is yummy also. Have a great week. Oh, I was craving pickles so bad last night - and I'm way past the age of being pregnant. There wasn't a pickle to be found. Then this morning I see your recipe. Must go buy pickles. Super! Simple! And, I have all the ingredients on hand. Now, may the best team win! Wow, those sound really great! I'll have to get some of those Sweet N Hot salad peppers! Did you buy the cracked pepper cheese at the Cracker Barrel restaurant? Sounds so good. Thanks for your comment on my cake balls - and Yes, buy one ( mine cost $16 on sale) The ideas are endless and easy - I plan on making a bunch and freezing them - then I can pull them out to either dip in melted chocolate or just dip 1/2 in frosting and put into small cupcake liners - so much easier than Bakerella's way of mixing cream cheese or frosting with crumbled cake! We are all pickle lovers in this house! Oh yum...I wrote the recipe out and will have to give this a try one day! Awesome combo! I like the salt and vinegar chips, so I bet this is sort of similar to that. Anything with dill rings my bell, or should I say hits the spot? Happy SBS! I'll have to look for those peppers, they sound great. Very interesting! You have found something really unique. You are such a good cook, Lynn. I LOVE pickle dip! I love that this has Worcestershire in it! Sounds different yet at the same time sounds good! I have a huge weakness for dip of any kind. I'll have to try this fer sure! Oh this is my favorite dip. This one is a little different than mine so I so have to try it out!! Hum. Might have to try this, we love dill pickles at my house. Pickle dip sounds like what I'd say when ticked off about a bothersome thing - Oh, pickle dip! Well, I never said it before but now I will. Oh my, the pickle dish sounds delish! It's perfect Super Bowl party food. This sounds so good. This seems so easy, I can see me making it for Sunday's game. Those pickles are worth a quick trip to Walmart. 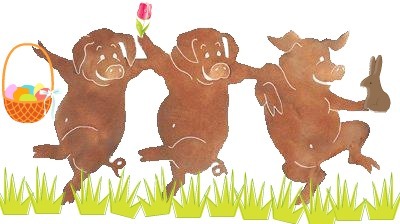 Lynn, Please go by my Etsy store I have a crewel piece with the cutest little pigs that you might like. Just sa thought. Oh my! Nothing could make my mouth water more than pickles and cream cheese and I don't know why I have never seen a dip like this! Talk about simple and wonderful. I definitely think I might be tempted to eat the whole bowlful and that would be a problem - wait if I were on a low carb diet and skipped the chips, I could have the bowlful couldn't I???? I wonder how it would be with sweet pickles, I don't like dill. Enjoy the game! My aunt was a Mara, so I hope the Giants win. Love pickles. Love chips. How could this possibly be bad? Thanks for the tip about the sweet/hot peppers. Hubby will go nuts over them! I am a pickle nut, so of course I will just love this dip. I am putting it on my Super Bowl Menu. 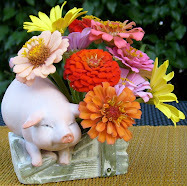 Hope you are having a great week end and thank you so much for sharing with Full Plate Thursday. OK, I LOVE pickles! However, when I made this I thought 1 T of Worcestershire was a bit much. I love Worcestershire also but would probably have done 1 t. If it needed more liquid I would add a splash of pickle juice. But it was loved by everyone at our family gathering.